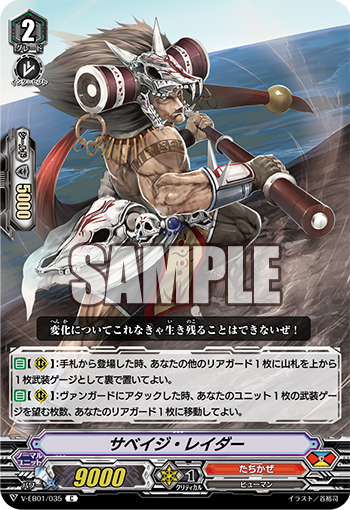 The Japanese Card of the Day for June 6th, 2018, is a Tachikaze Common from V-Extra Booster 01: The Destructive Roar that supports the new Armament Gauge mechanic introduced yesterday. AUTO [Rearguard Circle]: When placed from your hand, place 1 card from the top of your down face-down as Armament Gauge for 1 of your rearguards. AUTO [Rearguard Circle]: When it attacks a vanguard, you may move any number of Armament Gauge from 1 of your units to 1 of your rearguards. Savage's second skill allows the rearrangement of any amount of Armament Gauge cards from any unit to any other rearguard every turn, so that Gauges placed on irrelevant units in the early game with Sonic Noa can be transplanted to cards with on-retire uses of the Armament Gauge like Blightops. The end goal of these plays is to manipulate the Gauge mechanic to come out at a net positive after retiring a unit, sacrificing one to draw two, and so forth. The only limitation is that it can't move Gauge between multiple units simultaneously, so you couldn't choose two rearguards to move Gauge from onto a third rearguard. His first skill confirms that Tachikaze can amass Gauge outside of on-boost skills, which is important because it means the clan can take full advantage of the extra front row rearguard circles it gains through the Accel Gift to rack up multiple Gauge in one turn via on-call effects. If building Armament Gauge had been restricted to on-boost skills as it appeared yesterday, then Tachikaze's Accel circles wouldn't be able to contribute to resource development. Being able to gain gauge on-call allows for rapid allocation of resources and a form of resource development independent of game flow, restricted only by the cards available on a particular turn. This has particular implications for the tempo of Tachikaze's Gauge mechanics. Because Gauge can be freely rearranged later on in the fight, from the moment the clan has the ability to build Gauge it should be doing so. At the moment opportunities to build Gauge are very limited, with Noa and Raider being the only cards we've seen, but this is inevitably going to change as we get more Destructive Roar reveals. Even after options expand however, it remains important to maximize the amount of Gauge built up as early as possible in order to place that gauge onto retire targets and set up Deathrex's final turn. The deck wants to hit a particular curve of development, one that will become more apparent as more cards are revealed. At the moment, it's easy to see Savage Raider being a staple alongside Blightops and Noa. The previous Japanese Card of the Day was Platoon Commander Butterfly Officer.